The zombie apocalypse is coming soon! An American team of biology researchers has recently created “zombie” cells that can outperform natural living cells. 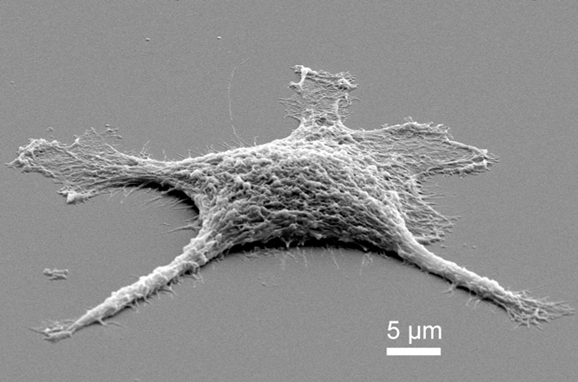 The technique used took mammalian cells and coated them with silica, which created a near-perfect replica. According to the Huffington Post, the Sandia National Laboratories and the University of New Mexico biology laboratories created “zombie-like” cells that can survive at greater temperatures and pressures than the original cells when they were alive. The biological researchers coated living cells with silicic acid in a petri dish, which embalmed or mummified the organic material down to its nanometer structure or level. The technique also created permeable armor around the zombie cell to protect it from real-world conditions. The lead researcher, Bryan Kaehr, denoted the difference between “mummy” cells and “zombie” cells: “Our zombie cells bridge chemistry and biology to create forms that not only near-perfectly resemble their past selves, but can do future work,” he said, horrifyingly. Why did the researchers assign us to certain doom in the zombie apocalypse? The research is to advance the study of reusable fossils that could be used as fuel cells. That’s right, zombie gasoline for cars, boats, and airplanes. The zombie cells could also be used for decontamination and sensor technology and commercial manufacturing, but none of that will matter once they rise up to wipe out the entire human race. Find a blunt instrument now; you’re going to need it when the dead rise from their graves to eat your braaains. Are we THAT dependent, and more to the point, that fucked as a species?! istead of making gasoline we should be forcing the oil companies to use the tech they’ve bought over the years to find other fuel sources. And what exactly gives you the right to force a private industry to do ANYTHING!?!? If you dont like an oil company’s product, dont buy it. Pretty simple really. Why are you defending conglomerates who care more about the pennies in their pocket than your welfare? It’s Hydraulic despotism! look it up. our lives revolve around it. Water, fuel, electricity etc etc. Load of rubbish I think. They converted Celsius to Fahrenheit wrong: 400 C should be 752 F, not 13,520 F. Without the proteins, the cells are nothing more than glass replicas of a cell with black carbon on the inside after heating. A dead cell is still a dead cell. I just think the author wants the zombie apocalypse to happen. So it made a shell of the original, that doesn’t burn. Good armor but its not gonna eat your braaains. Does anybody else think that picture looks like roadkill? Let it happen let the dead rise out of the ground. I for one welcome the idea for am ready. I have prepared for this for years! I know myself and my family will be safe. With the help of my friends that help prepar for this day to come. What happened? Did punctuation kill your parents or something? One poster mentions that “the cells are nothing more than glass replicas”, but as he points out 400 C is only 752 F and “Human flesh requires extended exposure to 1,400 degrees Fahrenheit in order to ignite”…we are all f’ed in the a’s…the end is near! Keep the “common” population dumb/sick/hungry and we’ll never rise up! OOH!! I forgot to say WAR is THE BEST form of population control!